A documentary about exiled Uighur activist Rebiya Kadeer is to be shown in Taiwan's second city, despite opposition from China. But officials in Kaohsiung said the film would be shown this week, not during a festival next month as originally planned. Businesses had urged the city to cancel the screening, fearing repercussions. China has accused Ms Kadeer of orchestrating recent violence it its Xinjiang region - a charge she denies. In July about 200 people were killed in ethnic violence between the region's Muslim Uighurs and Han Chinese settlers. Security has remained extremely tight there since then, amid reports of ongoing tensions and sporadic violence. On Friday, a spokesman from Beijing's Taiwan Affairs Office said it opposed the screening and urged the city "not to stir up trouble" in cross-strait ties, Xinhua news agency reported. Officials in Kaohsiung said that they would show the documentary, The 10 Conditions of Love, four times in the coming week. "To draw the curtains over this controversy as soon as possible, the film will be screened ahead of schedule," the city said in a statement. Local tourism officials had spoken out against the move, Taiwanese media reported, fearing it would drive Chinese tourist numbers down. 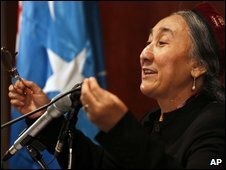 Rebiya Kadeer heads the World Uighur Congress, which represents the Uighur community in exile. Once a prominent businesswoman in Xinjiang, she was jailed for five years for sending newspaper reports about the Uighurs - some of whom want greater autonomy from China - to her US-based husband. When the film was shown at the Melbourne Film Festival, diplomats urged Australian organisers to withdraw it, several Chinese films were withdrawn and hackers - apparently Chinese - attacked the festival's website. Beijing is already angry about a recent visit to Taiwan by Tibet's spiritual leader, the Dalai Lama. China considers the exiled Dalai Lama a dangerous separatist and self-governed Taiwan to be part of its territory.